As his administration faces questions about recent appointments and departures, Gov. 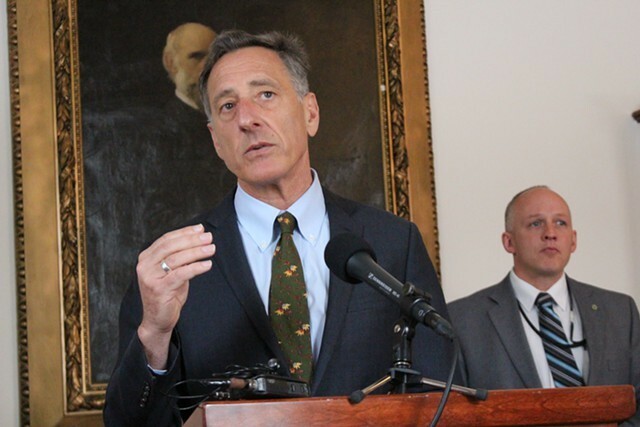 Peter Shumlin has thrown his support behind a proposal to create a state ethics commission. According to spokesman Scott Coriell, the governor's position is nothing new. “Had he been asked before all this, I’m sure he would have supported it as well,” Coriell told the Associated Press' Dave Gram, who first reported the development Wednesday. "As best as I can recall, this is the first time the governor has been asked about this," Coriell told Seven Days in a separate written statement. But Shumlin has been asked before — and declined to endorse the idea. In January 2014, the advocacy group Campaign for Vermont released a series of ethics reform proposals, including the creation of an independent ethics commission. Shortly thereafter, Seven Days requested an interview with Shumlin to ask him about the organization's ideas. Instead, then-spokeswoman Sue Allen provided a vague written statement saying the governor was "generally supportive of uniform disclosure of financial information and conflicts for elected officials." She said the administration would be "happy to review proposals" put forward by the legislature but hadn't looked closely at CFV's ideas. Seven Days followed up with five specific questions touching on CFV's proposals. Among them: "Does he support establishing a quasi-judicial ethics commission with the power to enforce [a state government] code of ethics?" Allen responded with another vague statement. She did not directly answer that or other questions Seven Days posed. "As the governor would say, the details on any of these matter, and so we'll have to see how they develop," she wrote. "He agrees with [House Speaker Shap Smith] that it is important to identify what problems exist before setting out conclusions." CFV's proposal has drawn more support in recent months, following ethics allegations involving Attorney General Bill Sorrell and Senate President John Campbell (D-Windsor), as well as the Statehouse arrest of Sen. Norm McAllister (R-Franklin). Last month, Secretary of State Jim Condos unveiled his own proposal to create an independent ethics commission. Shumlin's endorsement of the idea Wednesday followed a week of news stories focusing on personnel changes within the administration. Later that day, Seven Days twice asked Coriell for an interview with his boss. "Why not?" Seven Days asked. Just left a phone message for you. I have several specific questions for the governor about Bruce Lisman's proposed ethics reforms. Any chance I could speak with him or you about them on the record? If not, should I send you my questions by email? As I mentioned in my message, I'm looking at an earlier deadline than usual next week, because I'm hoping to make it down to Montpelier on Tuesday. Give me a ring if you can and we can discuss. He’s on the record on this already, generally supportive of uniform disclosure of financial information and conflicts for elected officials; he thinks uniform disclosures that everyone elected adheres to would be welcome by the voters. Like anything, we’re happy to review proposals the legislature may consider and understand the Speaker has a group of legislators looking at the issue. We haven’t seen anything from CFV other than what was released to press yesterday. Okay, great. Thanks for getting back to me. So he's generally supportive of mandatory financial disclosure for just statewide officials — or legislators too? -Does he support a two-year "revolving door" ban on ex-legislators and administration officials lobbying state government? -Does he support establishing a "code of ethics" that government officials would have to sign and adhere to? -Does he support establishing a quasi-judicial ethics commission with the power to enforce that code of ethics? -Does he support a statutory ban on nepotism? -Does he support a broadened gift ban (not just from registered lobbyists)? Thanks again for your earlier response. Do you think you can get back to me with answers early Monday afternoon? Again, if it's easier just to talk over the phone, that's fine too. As the Governor would say, the details on any of these matter, and so we'll have to see how they develop. Vermonters want to ensure qualified people are willing to serve. As the Governor said when asked by press last week, he supports financial and conflicts disclosure for all elected officials serving in Montpelier. Having the same rules in place for those who make the laws and are elected to carry them out makes sense to him, but if CFV or others propose something different we'll review it. He agrees with the Speaker that it is important to identify what problems exist before setting out conclusions. Heading into the start of the 2014 legislative session, his focus is on jobs and economic development, education, balancing state spending, health care, and other critical issues on the agenda.